White House Creates 'Climate Hubs' To Help Rural Towns, Farmers : It's All Politics President Obama used an executive order to start a program intended to help farmers and ranchers cope with weather changes that have begun to alter growing seasons and crop health. Farmers in Iowa are among those around the country who will get help coping with climate change through a new federal program. The White House on Wednesday rolled out a high-profile plan to help farmers and ranchers adjust to climate changes that have already begun to upend growing seasons and threaten livestock. The "climate hub" initiative was praised by environmentalists, though they were quick to warn President Obama that it would not provide him cover on another environmental issue in the headlines: the Keystone XL pipeline. "This is a great step, but it would be the height of irony to create climate hubs to help farmers adapt to climate impacts, and then approve a giant tar sands pipeline that would only make those impacts worse," says Jamie Henn of 350.org, a climate organization at the forefront of opposition to the Keystone XL. "There's nothing this administration can do that would give them a pass on Keystone XL," Henn says. A new State Department report downplayed the potential effects the TransCanada pipeline from Alberta to Nebraska would have on climate change, arguing the fuel would still be extracted and transported without Keystone. Obama is expected to decide on its fate in coming months. At the Natural Resources Defense Council, international program director Susan Casey-Lefkowitz gave Obama — who created the U.S. Department of Agriculture hub program by executive order — credit for "speaking out on climate change a lot in recent months." The seven hubs situated in existing USDA labs are poised to address, she says, the "very real harm and impact of climate change on our farmers, who are on the front lines, and are suffering." "This is not cover for the president — he has to start saying no to dirty energy projects like Keystone – but it's an important step in a package of actions that the administration is committed to taking and still needs to take," she says. Just how important a step it could be is illustrated in graphic detail in a new federal assessment of climate change. "We're moving into a period of extreme climate variability," says Jerry Hatfield, a co-author of the assessment's chapter on agriculture and director of the National Laboratory for Agriculture and Environment in Ames, Iowa. 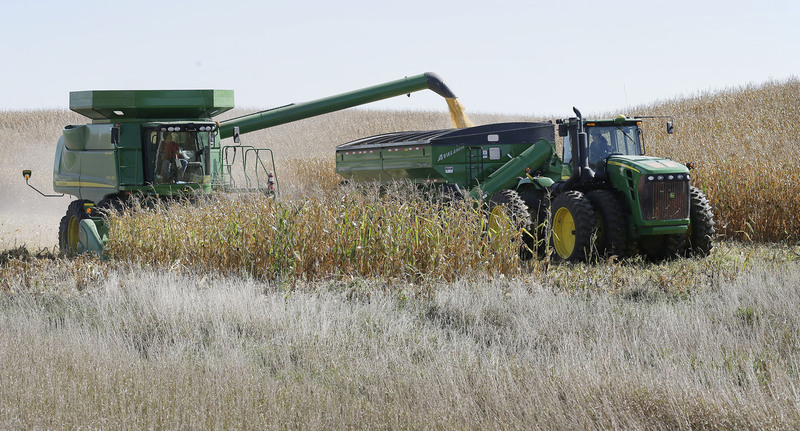 His federal Agriculture Department facility will serve as the "corn belt" hub. Declines in crop and livestock production from stress due to weeds, diseases and insect pests. Soil degradation caused by increasing extremes in precipitation; shifts in growing and harvesting seasons. Potential for disruption in food security in the U.S. and globally. Hatfield, who has a doctorate in agricultural climatology and has worked in the field for four decades, says farmers in Iowa are now becoming used to unusual weather variability. "Over the last four years across Iowa, it's been wet, dry, wet, dry — nothing close to normal," he says. The purpose of the hub is to get scientific information on climate change out to those farmers, and to work with them to adjust to wetter springs, shorter growing seasons, accelerated planting seasons and extreme heat spikes. The administration's goals are all good, says Elijah Zarlin, a senior campaign manager at CREDO Action, an organization that helps fund progressive nonprofit organizations, including opponents of the Keystone XL. "The administration has a clear interest in learning how to mitigate ongoing climate change," he says. "But if the president wants to prove he's serious about climate change, and moving the country in a new direction, rejecting Keystone would be a start." "It's a very simple decision, and it's his and his alone," Zarlin said. One much more difficult, however, than ordering up a climate change education program for the nation's farmers. A previous version of this story incorrectly referred to the Natural Resources Defense Council as the National Resources Defense Council.